Meeting in Colombo with representatives of the religions present in the country. "Dialogue will accentuate how varied our beliefs, traditions and practices are. But if we are honest in presenting our convictions, we will be able to see more clearly what we hold in common. New avenues will be opened for mutual esteem, cooperation and indeed friendship". Colombo (AsiaNews) - The peaceful coexistence between people of different ethnicity and religion is a fundamental value of peace. For this reason, "For the sake of peace, religious beliefs must never be allowed to be abused in the cause of violence and war. We must be clear and unequivocal in challenging our communities to live fully the tenets of peace and coexistence found in each religion, and to denounce acts of violence when they are committed". 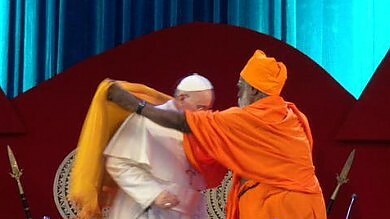 Although pronounced in a country such as Sri Lanka, which has only recently emerged from nearly 30 years of civil war, the words spoken by Pope Francis in the afternoon meeting with the religious leaders of the nation evidently go beyond the national context and return as a warning to religious leaders around the world. A thousand people, representing the religious communities in the island were gathered: in the Bandaranaike Memorial International Conference Hall in Colombo: Buddhist (70%), Hindus (12.6), Muslims (9.7) and Christians (7.2) . Here, as everywhere since his arrival, the Pope has been greeted with warmth: this morning, on his arrival, the crowd that thronged along the 28 kilometers that separate the airport from the Apostolic Nunciature, at least 300 thousand people - and many elephants - caused a delay of an hour in his program, and the cancelation of the anticipated greeting to the bishops of the country. At the Bandaranaike Memorial International Conference Hall there was traditional music, a Buddhist chant, Hindu and Muslim blessings, prayers from an Ecumenical Group and the speech of a Buddhist monk (pictured). Francis arrived here after a visit to the newly elected president Maithripala Sirisena and again his address focused on the need for coexistence to give new life to a country which, in addition to the devastating civil war, has also suffered the tragedy of the 2004 tsunami. Francis recalled the visits made to the country by Pope Paul VI and John Paul II and repeated the statement of Vatican II on non-Christian religions, where it says that the Catholic Church," rejects nothing of what is true and holy in these religions. She has a high regard for their manner of life and conduct, their precepts and doctrines". "For my part", he added, "I wish to reaffirm the Church's sincere respect for you, your traditions and beliefs. "It is in this spirit of respect that the Catholic Church desires to cooperate with you, and with all people of good will, in seeking the welfare of all Sri Lankans. I hope that my visit will help to encourage and deepen the various forms of interreligious and ecumenical cooperation which have been undertaken in recent years ". "These praiseworthy initiatives have provided opportunities for dialogue, which is essential if we are to know, understand and respect one another. But, as experience has shown, for such dialogue and encounter to be effective, it must be grounded in a full and forthright presentation of our respective convictions. Certainly, such dialogue will accentuate how varied our beliefs, traditions and practices are. But if we are honest in presenting our convictions, we will be able to see more clearly what we hold in common. New avenues will be opened for mutual esteem, cooperation and indeed friendship". "Such positive developments in interreligious and ecumenical relations take on a particular significance and urgency in Sri Lanka. For too many years the men and women of this country have been victims of civil strife and violence. What is needed now is healing and unity, not further conflict and division. Surely the fostering of healing and unity is a noble task which is incumbent upon all who have at heart the good of the nation, and indeed the whole human family. It is my hope that interreligious and ecumenical cooperation will demonstrate that men and women do not have to forsake their identity, whether ethnic or religious, in order to live in harmony with their brothers and sisters. How many ways there are for the followers of the different religions to carry out this service! How many are the needs that must be tended to with the healing balm of fraternal solidarity! I think in particular of the material and spiritual needs of the poor, the destitute, those who yearn for a word of consolation and hope. Here I think too of the many families who continue to mourn the loss of their loved ones". "Above all, at this moment of your nation's history, how many people of good will are seeking to rebuild the moral foundations of society as a whole? May the growing spirit of cooperation between the leaders of the various religious communities find expression in a commitment to put reconciliation among all Sri Lankans at the heart of every effort to renew society and its institutions. For the sake of peace, religious beliefs must never be allowed to be abused in the cause of violence and war. We must be clear and unequivocal in challenging our communities to live fully the tenets of peace and coexistence found in each religion, and to denounce acts of violence when they are committed. Dear friends, I thank you once again for your generous welcome and your attention. May this fraternal encounter confirm all of us in our efforts to live in harmony and to spread the blessings of peace. " The meeting, after which the Pope met individually with some religious leaders, concluded the first of three days that Francis will spend on the island.